(Phys.org)—A small team of researchers with members from the Natural Museum of London, King's College, and the University of London has conducted a study of the toothlike skin denticles exhibited by many chondrichthyan and has determined that they are not likely related to real teeth. In their paper published in Royal Society Open Science, the team describes their scanning study and their results. Chondrichthyan are a class of jawed cartilaginous sea creatures (fish) that include sharks, rays, and others that exhibit skin denticles, aka placoid scales. They have skeletons made of cartilage, rather than bone and typically sport tough sandpapery skin which is quite often covered with dermal "teeth." Three groups in the class include those with sawlike growths on their heads: Pristiophoridae (sawsharks, Selachii), Pristidae (sawfish, Batoidea) and the extinct Sclerorhynchoidea (Batoidea). The skin covering of many in the class are well known, the researchers report, but much less has been learned about the morphological diversity among the group. In this new study, the researches sought to try to understand if the sawlike growths were related to actual teeth. To find out, they undertook a study of several specimens from embryos to adults. The study consisted of scanning specimens using the Metris X-Tek HMX ST 225 uCT scanner, a type of X-ray computer tomography that provides detailed 3D imagery—and then analyzing the results. 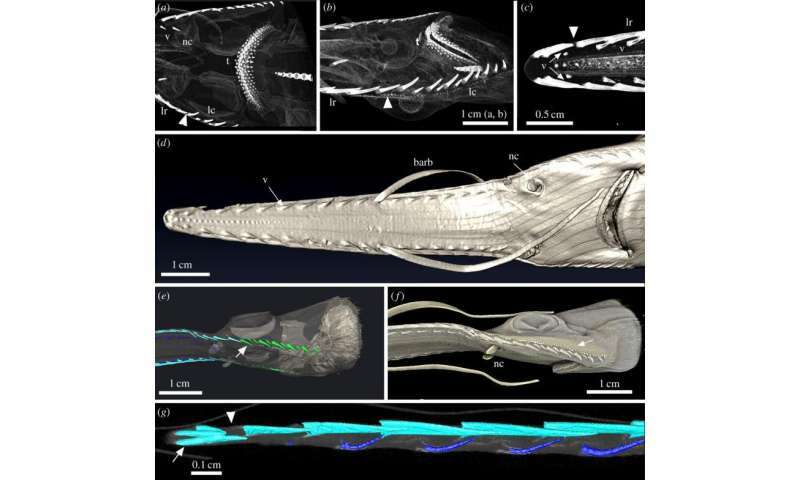 In looking at how the sawteeth come to be, the researchers noted that the sawteeth of Pristiophoridae and Sclerorhynchoidea were morphically similar despite not being very close phylogenetically—in those, the sawteeth develop under the skin in embryos—and in adults are replaced as needed. The sawteeth in Pristidae, on the hand, were inserted into sockets in the cartilage and grew continuously and thus never needed replacing. Real teeth, in contrast, develop in an ordered sequence governed by genes and those that are lost are replaced by those that have been pre-formed in rows, for just that purpose. Because of these major differences, the researchers have concluded that sawteeth are closely related to other dermal skin denticles but not to other real teeth—they only look similar. A well-known characteristic of chondrichthyans (e.g. sharks, rays) is their covering of external skin denticles (placoid scales), but less well understood is the wide morphological diversity that these skin denticles can show. Some of the more unusual of these are the tooth-like structures associated with the elongate cartilaginous rostrum 'saw' in three chondrichthyan groups: Pristiophoridae (sawsharks; Selachii), Pristidae (sawfish; Batoidea) and the fossil Sclerorhynchoidea (Batoidea). Comparative topographic and developmental studies of the 'saw-teeth' were undertaken in adults and embryos of these groups, by means of three-dimensional-rendered volumes from X-ray computed tomography. This provided data on development and relative arrangement in embryos, with regenerative replacement in adults. Saw-teeth are morphologically similar on the rostra of the Pristiophoridae and the Sclerorhynchoidea, with the same replacement modes, despite the lack of a close phylogenetic relationship. In both, tooth-like structures develop under the skin of the embryos, aligned with the rostrum surface, before rotating into lateral position and then attaching through a pedicel to the rostrum cartilage. As well, saw-teeth are replaced and added to as space becomes available. By contrast, saw-teeth in Pristidae insert into sockets in the rostrum cartilage, growing continuously and are not replaced. Despite superficial similarity to oral tooth developmental organization, saw-tooth spatial initiation arrangement is associated with rostrum growth. Replacement is space-dependent and more comparable to that of dermal skin denticles. We suggest these saw-teeth represent modified dermal denticles and lack the 'many-for-one' replacement characteristic of elasmobranch oral dentitions.